Just to get this out of the way. The term CLEAN is just something I’m using personally. While this model fits nicely into Bluemix, there is no such IBM product or offering. 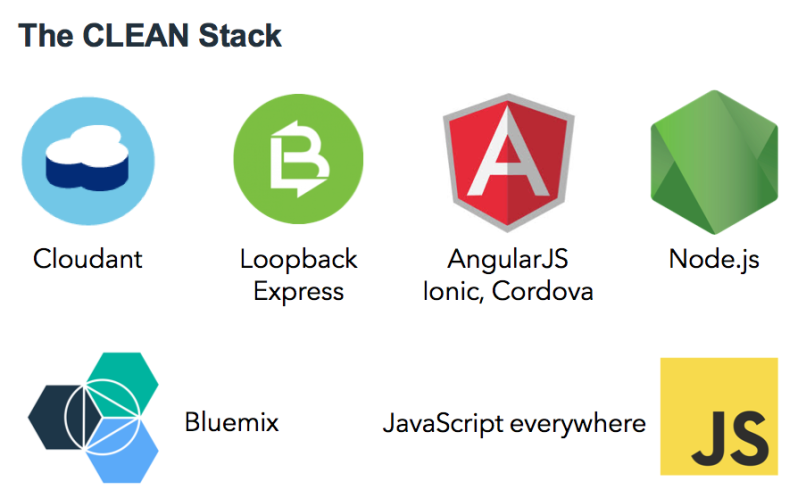 CLEAN stands for Cloudant NoSQL DB, LoopBack, Express, AngularJS, and Node.js. It’s similar to the MEAN stack with two significant differences. With the importance of the API economy, I looked for a mechanism to easily build and document APIs. LoopBack has a lot to offer along those lines and last week even more exciting announcements were made around API management. Also, a lot of applications require access control to certain information on both the application and object level. I briefly evaluated other ways to do authorization in Node.js applications, but for me, the built-in functionality in LoopBack was much easier to use. The CLEAN stack uses Cloudant instead of MongoDB, but LoopBack actually supports MongoDB as well. One reason I chose Cloudant was just because I like it. The other reason was that the Bluemix MongoDB service is not fully integrated with Bluemix yet, and I wanted the deployment to be as easy as possible. Check out the slides and the series of blog articles for more information.